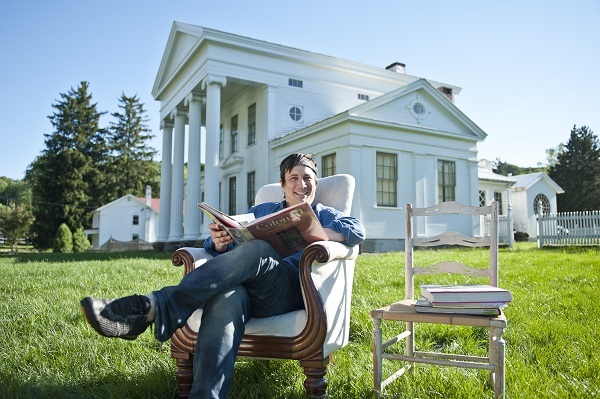 From Beverly Hills, Calif. to small-town Harford, Pa., Bronson Pinchot lets viewers in on his little known secret. When he is not in front of the camera in Hollywood, he is pursuing his passion for restoring old homes in his middle-of-nowhere USA getaway. Premiering Saturday, Feb. 11 at 10:30 p.m. ET, the actor best known as Balki on the family sitcom “Perfect Strangers” and in films such as “Beverly Hills Cop” and “Risky Business,” shares his addiction for hands-on home restoration and proves how a neglected house can be transformed into a historical masterpiece. After purchasing a half dozen period homes in rural Harford, including a tiny, historic post office that still operates, Pinchot has formed a 15-acre dream restoration colony. While adjusting to the slow pace of country life, Pinchot sleeps in the loft of his Greek revival home so that he can eat, live and breathe historic restoration. Throughout the series, Pinchot renovates three eye-catching properties, including a dramatic transformation of the colossal “Decker House,” pieced together from scraps of salvaged wood. From assembling different pieces of rescued materials in a process he likes to call “Frankensteining” to attaching sticky notes to himself to remember his punch list, Pinchot brings restoration to a whole new level with his signature quirkiness and dramatic flair. With the help of his sidekick and surrogate son, Mikey, and his no-nonsense carpenter, CJ, Pinchot shows just how entertaining and trendy reusing and repurposing can be. Whether pulling an all-nighter to find the best gasolier globes online or filling his barns with irreplaceable artifacts, Pinchot inspires his audience to embrace home restoration with excitability and eccentricity. With each project that Pinchot takes on, he proves how easy it is to step back in time 200 years, preserving a whole lot of history with a little bit of modern determination.